The Zoom! Whitening System is a revolutionary tooth whitening procedure. It's safe, effective and fast - very fast. In just over an hour, your teeth will be up to 10 shades whiter. Zoom! Whitening is ideal for anyone looking for immediate results. The convenience of Zoom! makes it the perfect choice for even the busiest of individuals. If you’re ready to unleash your smile’s hidden potential, simply contact us today. In just an hour, you can get a set of teeth that will instantly capture eyes and demand attention. The Zoom! 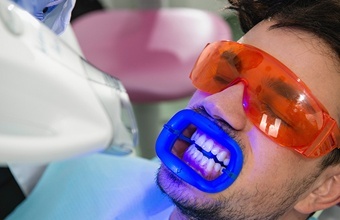 Whitening procedure is simple and painless. It begins with a short preparation to isolate your lips and gums. Then, the proprietary Zoom! Whitening Gel will be applied and activated by a specially designed light. Teeth typically become at least 6 to 10 shades whiter, sometimes more. A five-minute fluoride treatment will complete the procedure, and you will be amazed with the results! In most cases, your teeth will get even whiter the first few days after the procedure. The Zoom! light-activated gel was developed after years of research conducted by dozens of scientists. The gel is a precisely formulated and pH balanced hydrogen peroxide solution that, when activated by the Zoom! light, gently penetrates the porous surfaces of teeth to remove deep stains and discoloration. The process is completed entirely in the comfort of our office. We apply a coat of whitening gel and the Zoom! light. The gel is allowed to work for about 20 minutes. Then, we check your progress. 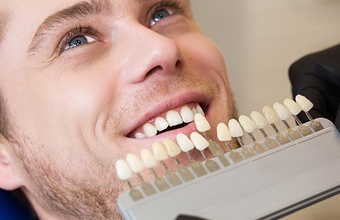 Most patients complete treatment with just two or three applications in one appointment, and we can typically whiten teeth between six and ten shades. With proper care and an occasional touch-up at home, your whiter smile will sparkle for years before you’ll need complete retreatment in our office. You should limit your consumption of staining foods and drinks and avoid tobacco use to maximize your results. Keeping up with your regular daily hygiene and visiting us twice a year for professional cleanings will also extend the life of your whitening results. We can also provide take home teeth whitening kits, so you can touch-up your results a few times each year.